Movie Title Screens - Academy Award-Winning Best Pictures: Title screens are the initial titles, usually projected at the beginning of a film, and following the logos of the film studio. They are often an ignored aspect of films, although they reflect the time period or era of the film, the mood or design of the film, and much more. Since its inception, the Academy Awards (hosted by the Academy of Motion Picture Arts & Sciences, or AMPAS), have honored one film each year, crowning it "Best Picture." Other names for the title have included Outstanding Picture, Outstanding Production, Outstanding Motion Picture, and Best Motion Picture. The announcement of the Best Picture Oscar winner is often the highlight of an Academy Awards ceremony. 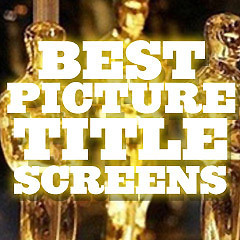 Every single Best Picture Oscar award winning film's title screen is here. The Academy Award ceremony that honored each of these films was held in the spring of the year following the film's release. See also: Academy Awards Best Pictures and Best Picture Milestones. Other pages with title screens include All-Time Top Summer Blockbusters, Greatest Film Franchises (Box-Office), Highest-Grossing Films by Genre, Great War Films, Greatest Guy Movies of All-Time, and the Pixar-Disney Animations.